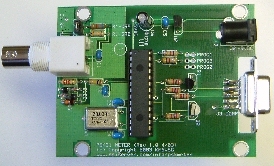 "PSKmeter is probably the MOST IMPORTANT development for PSK31 since DigiPan!" --Skip Teller, KH6TY, creator of Digipan. "The PSKmeter may be the Holy Grail PSK operators have been seeking..."
--Steve Ford, WB8IMY, QST February 2004. PSK31 is one of the most exciting and friendly modes of operation in amateur radio! PSK31 is a great way to communicate across the country and around the world, working DX with almost any power level. PSK31 is a good use for your computer and its sound card. Using waterfall presentations in frequency space revolutionizes the way we think of tuning our radios. User-defined macros let you swap information with buttons. Keyboard -to-keyboard communication lets you send and receive information in a friendly and efficient way. For all of its advantages, however, PSK31 has an important requirement that you need to be constantly mindful of-overmodulation! PSK31 depends very directly on the audio level that you have set in your computer's sound card. If the audio level is too low, your signal will be weak and noisy. If the audio level to too high, you will have plenty of power, but also plenty of splatter! Every PSK31 operator has seen other stations signals that are overdriven: instead of seeing two clean tracks on the waterfall display, you will see multiple tracks every 31 Hz on both sides of the signal, creating interference for other QSOs. An overmodulated signal is also going to have more received character errors than a clean signal. The problem is that while you can certainly see problems with other's signals, you cannot know whether your signal is weak and noisy, or overdriven and creating splatter. The reason is that you cannot "see" your own RF signal. What you need is an RF monitor that can sample your transmitted output, knowing what PSK31 signals should ideally look like, and inform you that your audio needs to be increase or decreased. 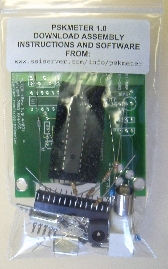 The PSKMETER is a special device that samples your RF output, digitizes it, and reports PSK31 "frames" back to your computer. In the matching PSKMETER software, your computer can not only display the your signal in real time, but can analyze the signal and determine if your audio setting is too low or too high, automatically setting your audio to give you perfect PSK31 signals all the time without you having to do anything. Shown above is the Windows application that runs on your computer showing you the exact shape of your RF envelope, the status of your signal ("OK", "SPLATTER", and "UNDERMODULATED"), its operational mode (if "AUTO", PSKMETER adjusts the audio level to always bring your signal status into the OK range), your transmitting IMD, and the output audio level. You can resize the display and set its position on the screen, and can either stay on top so you can always "see" your signal, or you can minimize the application and still see the condition of your signal on with an icon on the system tray. PSKMETER is designed to let you configure it just about anyway you want to suite your taste. By connecting your PSKMETER to a free comport on your computer (or connecting to a USB port with the optional Serial/USB converter), connecting your transmitter's RF output via a 'T' connector, and running the PSKMETER software application, your signals will be perfectly adjusted, automatically for you. Ready to build it? Click Here. 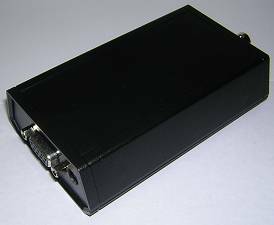 The PSKMETER is designed to perfectly fit into the optional enclosure shown here. "This is just a note to say T*H*A*N*K* Y*O*U for 'PSKmeter'. This is one of the best kept secrets in the PSK31 community!! I put it on my old 300Mhz laptop and it worked just fine. The kit building went extremely well. The PCB is easy to solder to and all the parts were clearly marked. It was no problem at all. Then I went on to download the .EXE file and it worked perfectly with the USB COM port adapter on the back of my laptop. I hooked it to my new Ten-Tec Orion and I was able to get -27db. I could see the immediate effect of PC audio drive, MIC gain, and XMIT SSB DSP signal shaping (XMIT audio equalization settings). Very interesting indeed. Thanks a million for such a great instrument to have in the shack. My PSK31 will indeed be the best I can generate!" "...anyone really can build it. Once assembled, the test instructions are entirely straightforward and easily followed. Software works great. So does the PSK31 Meter !!!!" I ordered the PSK31 meter and assembled it. I am hardly an adept kit builder. The last kit I did was a Dynaco amplifier back in college [35+ years ago]. Aside from being bemused by the state of my eyesight, I found the directions clear and I was able to assemble the kit in a short morning. An experienced kit builder could probably do it in about half that time. It worked on the first attempt. I purposely mis-adjusted my transmitter and watched the PSK31 meter do the adjustments and reach an optimal level. I tried too much drive and too little drive. It worked either way. I ran a few on air tests with good results. Really, it is a neat product.